Now available to all registered sites, the Scheme’s new A1 posters allow you to display your site’s considerate performance to the public. 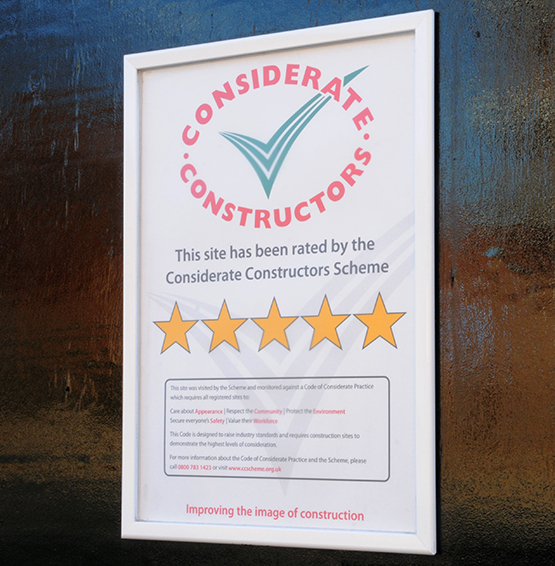 The posters have been developed by the Scheme following requests from contractors and clients to easily demonstrate their considerate credentials to the public following the latest visit from the Scheme Monitor. Using a star rating system ranging from three stars up to five, the posters will, for the first time, give sites an opportunity to promote how well they have performed against the Code of Considerate Practice. Registered companies and suppliers can also promote their considerate efforts with a star rated certificate to display either at their office or on site. These are available on request.